Once again, Beit Shemesh is the world's leading staging ground for conflict between charedim and non-charedim, thanks to Mayor Moshe Abutbul and his charedi municipal coalition. 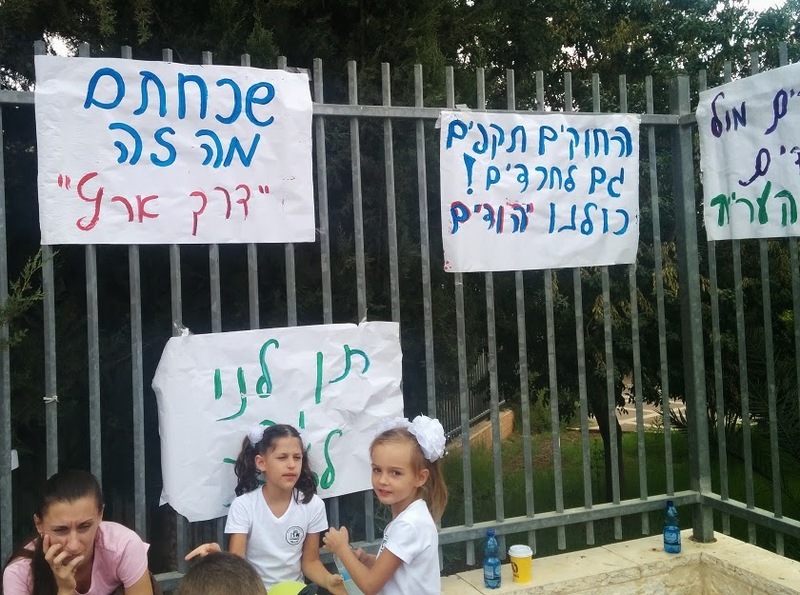 This time, it's about a school in Ramat Beit Shemesh, Safot V'Tarbiyot. The school is designed to be a prestigious institution serving the secular population of the entire Greater Beit Shemesh area. As such, it is large and well-equipped, and can service a large number of students. But there is low enrollment, due to the fact that many secular Israelis have fled Beit Shemesh as a result of the charedi takeover. The school is located in an area that has recently become mostly (though not entirely) charedi. The many charedi schools in the area do not have buildings and are located in caravans; somehow, the charedi mayor and coalition were not able to build any schools for them in their previous term. Thus, the charedi population has long wanted to use (part of) the building of Safot V'Tarbiyot. If you believe the charedi account of events, they have been trying to work this out for years. If you believe the non-charedi account of events, there was never any attempt to work this out, bar a single meeting that was supposed to be held with mayor Abutbul which he did not show up at. Yesterday, on the day before the new school year, Abutbul decided that the municipality would take matters into its own hands. He sent security guards and workers to break into the school and physically partition it into two schools, one to service the charedi population as a girls' school. Needless to say, this did not go down very well with the non-charedi population. Physical fights erupted, and the police had to be called in. There is a furious letter from the Ministry of Education threatening Abutbul with serious consequences. There are several issues to be considered here. One is whether the charedi population is entitled to take over part of the school. On the one hand, it has low enrollment; on the other hand, it is a high-quality school that is supposed to have a lot of rooms for enrichment activities. Apparently, as a result of the separation, the boys and girls in the secular school now have to share a single bathroom. But the second issue is that even if one takes the position that the charedi population deserves part of the building, surely there is a way to go about doing this. Forcibly creating facts on the ground, on the night before school starts, is guaranteed to cause ill will. A third issue is that Abutbul did not only divide the school interior into two areas. Outside the school, the playground has a natural division into two areas, due to its being on a terraced incline. The terrace is separated by a barred fence, which would also serve to separate the playground for the newly-divided school. But this barred fence was considered insufficient. Abutbul's workers erected an ugly eight-foot-tall wall along the bars, made out of metal panels. The purpose of this fence was apparently so that the charedi girls should not have to see the secular schoolchildren. The secular population is livid at this. They tried to destroy it this morning, and one person painted on it "Separation Wall - A Disgrace To Zionism!" The police were called in again. Now, I certainly understand that charedim do not want to expose their children to foreign lifestyles. However, to suddenly take over half a school and build a huge ugly dividing wall in the middle is extremely insensitive. One would think that deracheha darchei noam should be an operating principle. This should be all the more true for a city that suffered terrible internal conflict in the last municipal elections, with Abutbul trying to win votes from moderates by claiming that he is all about love and unity. But aside from the in-your-face disdain for good community relations, what amazes me is that Abutbul and his coalition do not seem to realize or care how they are harming the charedi community's own national interests. Provoking conflict like this, forcibly taking over a school, with appalling photos and videos playing out in the media, reinforces the view in the rest of Israel that charedim are taking over the country in unpleasant ways. In the last election campaign, local Anglo-charedi rabbonim such as Rav Kornfeld and Rav Malinowitz fervently tried to berate people into voting for Abutbul. They argued that there is a "war on Torah" and that it is important to strengthen the charedi community. When Abutbul won, I argued that in fact this was going to weaken the charedi community in the national arena. As I wrote at the time, the charedim are kicking and screaming about the new national government, which is trying to cause many people to leave kollel and change the way in which they educate their children. But the irony is that the particular person most hated for all this, the person who is behind the make-up of the government and its policies, is Yair Lapid. And the single person most responsible for Yair Lapid's extraordinary rise to power is Moshe Abutbul. Exactly as I predicted after the last elections, with the re-election of Abutbul, there are further explosive events in Beit Shemesh. Abutbul continues to give the city a bad name. And the rest of Israel will respond by continuing to give political power to Lapid and Bennet. There are few things that the rest of Israel fear more than a hostile takeover by charedim. Seeing such a takeover happening in Beit Shemesh, as per Rav Aharon Feldman's publicly voiced hope that Beit Shemesh will turn into Bnei Brak, will galvanize the rest of Israel into uniting to prevent the charedi lifestyle from taking over Israel. It's bad news for Beit Shemesh that Abutbul was re-elected. Yet it may well be good news for the State of Israel and the Jewish People. I wish I could do something about this. It pains me greatly when I hear such news; do the chareidim think such actions bear no consequences? You seem to be only siding with the secular account of the attempted meetings. Why don't you believe the official statement from town hall: העירייה זימנה כמה פעמים את מנהלת בית הספר לשפות ותרבויות השוהה במבנה העירוני לדיון בנושא במטרה להגיע להסכמה, אך זו ביכרה להיעדר במפגיע? No school is expected to have their children learn in the streets. Schools are under the jurisdiction of town hall and not the private property of the school management or the school board. If they refuse to co-operate they have to be moved by force. It is outrageous to blame the Mayor for this and state as facts your opinion of how things happened - basic humility and decency would expect you to at least express some kind of doubt. I quoted both sides' version of events leading up to today (see the fourth paragraph). There are no disputes (as far as I know) regarding what actually happened today. I happen not to believe the mayor's version, because I saw him blatantly lie to Ami magazine during the Orot fiasco, claiming that the school was in the middle of a charedi area. Who to believe? Maybe the mayor who has had plenty of power, and 4 years since the first time he tried to take away part of Safot - he could have made loud public overtures for valid options to relocate the school. But no, it was quiet, no talk of this issue, until suddenly the day before school started. chareid ploni: Read the article. RNS didn't offer an opinion as to whether or not the school should ultimately remain as is, be shared or dedicated entirely to chareidi education. The article is about the way that the iriya forced the issue, and how RNS believes that it will impact on chareidi interests on a national scale. Do you have an opinion about that? There is no impact on chareidi interests on a 'national' scale. This is a simple issue of a municipality's obligation to its citizens. Why force 100 students to bus in from far away, when you can move the school closer to them? -- don't you feel sick that local children sit in hot caravans in the summer, when there are 400 empty seats in this building? Stop using the children for political gains - stop making them suffer. That school has always had the vast majority (if not plurality) of its students bused in from Bet Shemesh. It was originally set up in RBS by the previous mayor Vaknin, specifically to try and "hold the fort" of secular education in a charedi neighborhood, perhaps as a last ditch hope for retaining any secular population in RBS (which didn't work, obviously). There is plenty of jusitification for the Iriyah to shuffle the allocated buildings for schools. As to what happened today, sounds more like the parents and staff of Safot V'Tarbuyot got a little violent this time. Hopefully, nobody will try to spit on and assault little charedi girls on the way to school. Maybe the wall is meant to pre-empt such a thing. And for the splitting of the city, pushed mainly by the loser of the last election, I would love to know the lines along which the split would be. RBS - charedim, Anglos and all - and its elevated arnona is still the primary income source for the entire municipality, so the seculars of Bet Shemesh might just be the ones in danger of losing money and subsidization. RBS - charedim, Anglos and all - and its elevated arnona is still the primary income source for the entire municipality, so the seculars of Bet Shemesh might just be the ones in danger of losing money and subsidization. What a strange comment. A large percentage of RBS residents receive substantial discounts on their "elevated arnona." You have to drink a lot of Koolaid (with a hechsher of course) to convince yourself that RBS provides a disproportionate amount of the Iriya's income. Oleh Vatik -- do you now what the income figures and demographics for the city are? The thing is, the municipality knows months before how many students they have enrolling in each grade for each "stream", and where the existing classrooms are. And yet, they prefer dealing with the situation in a confrontational manner at the last minute. Poor planning and management, unless their real goal is sowing hostility and encouraging flight of their tax base. Laws are only as good as the will to enforce them. Short of the police showing up, forcibly dismantling the barrier and removing the Chareidi students, Abutbol's side will have won without facing any consequences for their actions. This will only encourage them to do the same thing again elsewhere. As for why they think they can do this with such insensitivity, surely you are aware that it is now de rigeur for Chareidism to interpret things like "Respect others" and "Be nice" in the narrowest way possible and saying that those rules only apply to others in one's group, not to outsiders. How is it 'Rationslist Judaism' to try and cause more sinat chinam, more strife, more distrust, more hatred, spread lashon hara, or motzi sheim ra, what possible good can come from this inciteful, hateful blog - wouldn't it be better to keep your thoughts to yourself, think about ways to make things better, maybe promote some kind of kiruc towards the families of safot vetarbut? Otherwise this is irrationalist, anti-semitic judaism! Maybe the good that can come out of this blog post is that people can be better informed about the consequences of voting for charedi mayoral candidates. This is a blog dealing with important issues in the religious community. Its not Pravda. You think that Yated and Hamodia are helping to solve messy issues like these by not reporting about them? I find it quite curious to charge RNS with hate,loshon hara, etc. Having witnessed countless Charedi involved events it is quite clear from where the majority of hate stems. The Bet shemesh elections, the march against the draft, riots about graves, and the list goes on. For those who claim to the true spokesmen of God I find it distressing how they portray love and acceptance. He's just pointing out the inevitable outcome of heavy-handed, magia-lee, arrogant and violent behavior by self-described holy and super-pious people who only think of their own interests all the time. These enemies of the state are uneducated, unprincipled, superstitious and out of control who feel they must win and/or be in control in every instance. A perfectly good target of this blog. The fact that the school is serving a different neighborhood is not uncommon here. Magen Avot is in bet and I doubt any kids from bet attend the school. Magen Avot is only there because of the lack of available classroom space in RBSA. Perhaps Safot would like to donate some space to them as well. From reading the various non-charedi news outlets (haaretz, times of israel, etc.) it seems that the non charedi opposition is being highly unreasonable in refusing the let the schooless girls use there empty classrooms just to spite the charedim. I definitely do not like the way things were done, but do the non-charedim get zero blame for this situation? Children need place to go to school. Secular school with much space and classrooms and very few children vs. Haredi schools that are overcrowded and have few space. Of-course then can and should take this school. GET OVER IT. I don't get this obsession? after having read the post I still think that blame for this situation .lies partially with non'charedim who are being very unreasonable with regard to sharing the school. Everyone agrees that there is a lot of empty space an that these girls need it. Rabbi Slifkin, do you not agree that the non-charadim are partially at fault? You have to appreciate the context, which is a charedi takeover of Beit Shemesh. I had a chiloni colleague who lived on Nachal Michah from the beginning of RBS, and then charedim moved in and started harassing him for driving on Shabbos. Then there is the attempts to enforce tzniyus, often to an extreme standard, and all the hatred in papers such as Chadash. Etc., etc. In the run-up to the last elections, Rav Aharon Feldman spoke in BTYA and said that there is an opportunity to turn Beit Shemesh into Bnei Brak. Is it any wonder that the secular population feels as though they are being run out of the city and doesn't want their school to suddenly be forcibly seized and partially taken over? Isn't that a BIGGER problem then someone being opposed to this? Why should a Jew be sensitive and caring and actually on the side of someone being Mihallel Shabbat vs. those who do not want this to happen. Something that is a capital offense with Karet as well. Moshe, they weren't protesting his actions and screaming at him out of concern for him. What would splitting beit shemesh into 2 municipalities do to rbs a, which is a mixed neighbourhood. Would it go chareidi or dl? Or would it be split street by street? The essential point gone unnoticed is that the chareidi girl's school, Mishkenot Da'at, has a plot assigned to it next to the shopping center, and this was done years ago. 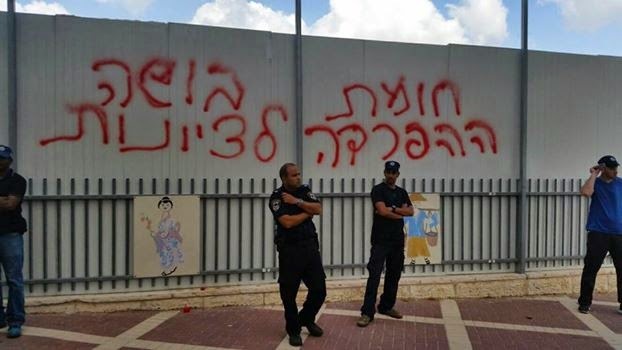 However, the city is not willing to build there, as doing so would require the eviction of several chareidi schools currently occupying that area with caravans. Abutbol would rather pick a fight with the chiloni public, who in any case he does not see as his potential voters, and not risk picking a fight with chareidim, leading to an Ashkenazi chareidi challenger in the next election. I don't know all that much of the politics and who has what land and where, but it sounds to me like absolutely nothing was done to minimize confrontation and to maximize shalom. Thus, regardless of what the Chilonim may or may have not done, the Charedim are violating their own supposed principles. Par for the course, I fear. I thought high-minded ideals are what separates Charedim from (other) Jews. An attitude of he-started-it! or he-hit-me-back! is not the Torah way. If the Charedim don't keep to these ideals under pressure, they are only paying lip-service to the idea that they are Charud L'dvar Hashem. In other words, they are liars, hypocrites, or worse. Here's the bigger picture: Chareidi parties have held in the balance of power in every government coalition since 1977 except for the current government's. Any prospective PM (and certainly the current one) knows that after the next election Shinui and HaBayit HaYehudi will be reduced to 3-4 seats each while Lapid and Bennett join Livni on the new hit TV show "Who thought they'd be prime minister?" Meanwhile the Chareidi parties will still be there holding the balance of power which means the government will put their interests ahead of those of general society. Further, when you upset a group of Chilonim you get angry letters to the editor. When you upset a group of Chareidim you get riots. If you're the police, which would you rather deal with? Forget the law and upholding it. Which would you rather deal with? Therefore this situation is done. The Chareidim now have half the school. Within a few months they will escalate a campaign of harassment against the secular side and drive out the children and staff. You've lost, cut your losses and retreat to the next hill. First, Shinui hasn't been in Knesset in years. You mean Yesh Atid. A loss of three to four seats for Yesh Atid would still leave it one of the largest parties in the Knesset. Every poll shows Bayit Yehudi gaining at least six or seven seats. I am not so sure. First of all, it was the Supreme Court that made the ruling regarding Haredi conscription, not the Knesset and it won't go away in the next Knesset either. Secondly, social welfare programs are under pressure around the world and it won't be easy to get significant increases from whatever government is in power. Thirdly, the rank-and-file of the Left were told that they had to make concessions to the Haredim in order for them to form a government so that they could supposedly "make peace" which was considered more important thus making it worthwhile to capitulate to Haredi demands. Today, the 'peace process' is realized by even those on the Left to be dead (whether or not there are 'negotiations' be held with Abbas) and the Left's public will be much more reluctant to support large-scale concessions to the Haredim, which they have traditionally been more reluctant to make than the Right. All the extremist rhetoric and actions have gotten considerable publicity in the media which has soured a lot of people on this issue, so the bottom line is that I don't believe that things can go back to they way there were in previous years. Why the residents of Bet Shemesh don't separate from RBS is beyond me. Why should they have to subsidize the harassment that they continue to endure at the hands of the charedim and Abutbul? On their own they can have lower taxes and a higher standard of living and municipal services. If they don't split off they will be swallowed and forced to leave. There are many who wish to do exactly that. The problem is, that as the last election showed, Charedim hold about 51% of the voting power, and they would never allow BS to split. They may not know much, but they know who's really paying the bills to keep the city running. And there are probably a significant percentage who don't vote Charedi who would also like to keep the city as-is. This means that short of State intervention, a split will never happen. Quite right, Ari. After RBS gimmel is populated the chareidi parties will have 60% or more thus gerrymandering the vote for ever. The question is - would this be decided on a local or national leve? If local then forget it but if national then there is hope. Bet Shemesh needs some very clever lawyers and (national) politicians if they are going to get a much needed divorce.